Jeff Dean and Stephanie Nicole Martin moved to Seagrove, N.C. in 1998 after college to create Dean and Martin Pottery. Their love of nature and the land is a continual inspiration for living the life of potter's in the heart of North Carolina... where they were both born and raised. Jeff Dean recieved a B.F.A. in Ceramic Design from East Carolina University. He makes pots that embody a strong sense of form. The forms generally come from something that he has seen in nature, or from a walk in a city or a town. Historical ceramics, architectural landscapes and oddly enough metal sculpture, jewelry,glass, and paintings seem to run through his mind whenever he is creating. Jeff always tries to balance form, function, and design into a cohesive grouping that will be pleasing to the owner. Most of his work is fired in a gas fired kiln to cone 10. He uses light colored stoneware clay, as well as local stoneware clay and porcelain to make the work. Some of the work that Jeff produces is fired in a wood-burning kiln. Wood-firing to Jeff is the purest and most natural way to fire clay. The marks that are achieved during a long firing are so beautiful that it is hard to believe that they were born of true serendipity. Whatever way he chooses to finish the work seems to be only the vehicle for this most elusive and malleable of materials... clay. Stephanie Nicole Martin attended the University of North Carolina in Greensboro, and received a Bachelor of Fine Arts in Design with a concentration in Ceramics. Stephanie works primarily with earthenware… making hand-built and wheel-thrown objects using color, pattern, floral, and figurative imagery to evoke a feeling of nostalgia. 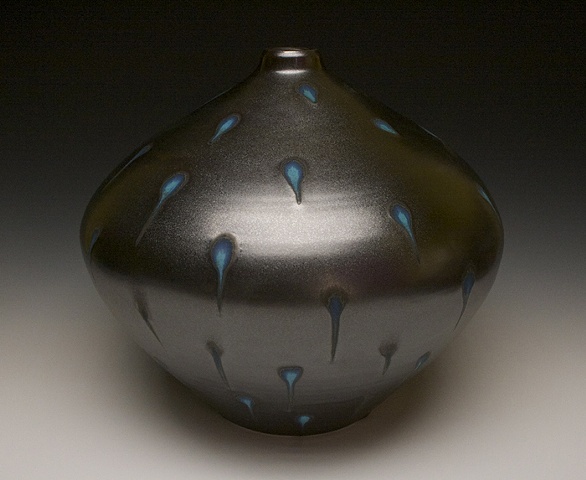 She utilizes many printmaking techniques to build the surfaces of her vessels. Digital technology plays an important role in her process – making her own iron decals, and transferring them onto the clay. Watching her grandmother sew her dresses, and quilt as a young child influenced her sense of craft and design. Most of the images she uses are rooted in 1960’s and 70’s culture. Stephanie’s work continually intertwines history and memory, and perpetuates her nostalgia of being a young girl growing up in the rural foothills on western North Carolina in the 1970’s.